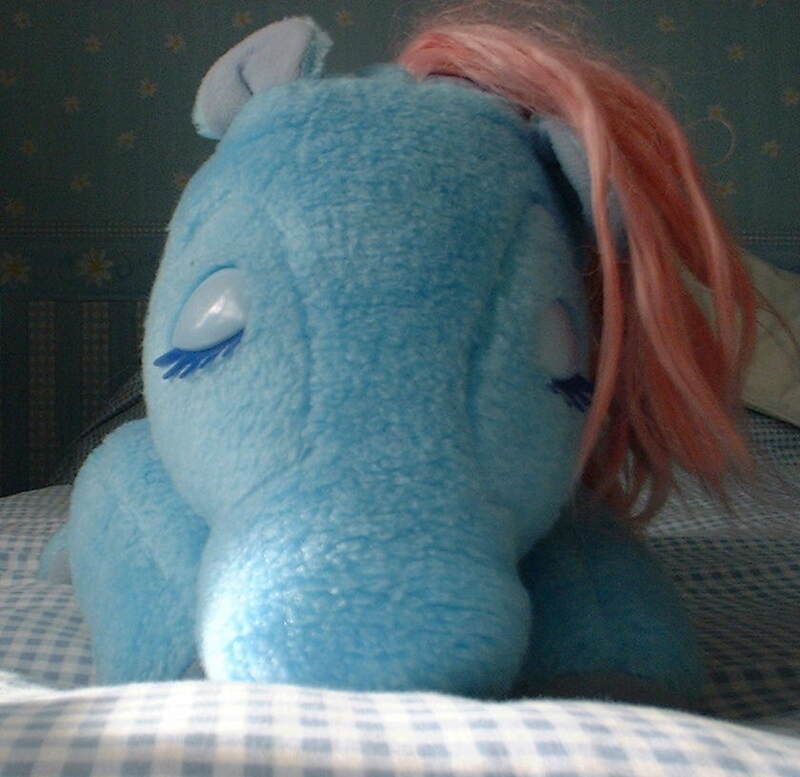 Lofty's Plush Paradise Pyjama Page- Featuring Hasbro Softies and other plush My Little Ponies! Pyjama Cases were made in the United Kingdom by Telitoy to store your jammies for an overnight stay at friends and families houses. 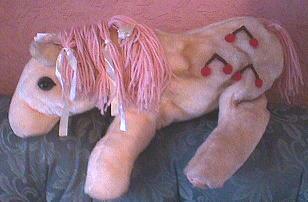 They were is the design of a pony with a zipper underneath them on there belly. I am not sure how many different ones were made I believe there were only five. Cotton Candy and Bowtie were in the laying down position and had sewn on felt symbols. Bubbles, Starshine, and Trickles were in the sitting position with plastic symbols. If you have any pics or know of more e-mail me at the link to the left and tell me about it! *~Pic needed~* Bubbles all yellow with blue hair and several plastic bubbles for symbol. Sitting up position with open eyes. 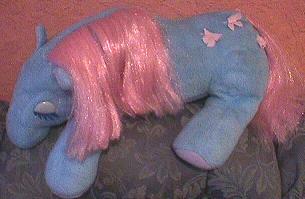 BowTie is blue with three sewn on felt pink bows. Her eyes are closed and has velcro on front legs. 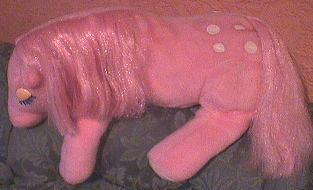 Cotton Candy is all pink with several white sewn on felt dots. *~Pic needed~* Starshine all white with rainbow hair and a yellow plastic star for symbol. Sitting up position with open eyes and floppy wings. Trickles is yellow with rainbow hair and watering cans for her symbol. Sitting up position with open eyes. Cherries Jubilee is pink with pink hair and three cherry bunches. She is different from the other two in that she has yarn hair and open eyes. She isn't mentioned above because she is fake/custom that was sold on eBay. Just wondering if your paying attention?